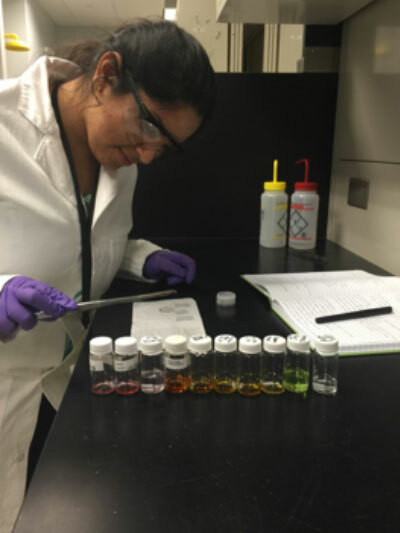 In the Mickey Leland Energy Fellowship (MLEF) Program at the National Energy Technology Laboratory (NETL), Emily Ghosh synthesized and characterized thin films with the overall goal of improving the structure of solid oxide fuel cells. An early fascination with the vastness of space made a career path in research seem natural for Emily Ghosh, whose parents are scientists. After receiving her bachelor’s degree in physics from Boston University, Ghosh entered the Mickey Leland Energy Fellowship (MLEF) Program to gain hands-on experience at a U.S. Department of Energy (DOE) facility. At the National Energy Technology Laboratory (NETL) in Pittsburgh, Pennsylvania, Ghosh helped improve the understanding of technologies related to solid oxide fuel cells, which are instruments that produce electricity from a chemical reaction. Under the mentorship of Paul Ohodnicki and Miaolei Yan, in the Advanced Sensor Lab, Ghosh was responsible for synthesizing and characterizing thin films that can be used for sensing applications in solid oxide fuel cells. During her 10-week program, she created stable homogenous solutions from starting materials and reactants. Next, she deposited and spun the solutions to coat a solid surface to create a film. In order to determine the benefits of her research, this method was compared to a more costly and complicated method of thin film synthesis. Ghosh had a physics research background, but she soon found that her project relied mainly on chemistry and materials principles. She engaged in further study, and she embraced the challenge of learning new experimental techniques such as sol gel thin film spin coat deposition and UN/Vis film characterization. After her summer at NETL, Ghosh’s goals for her future became clear. She hopes to continue to contribute to sustainable energy research and eventually return to school for a doctoral degree in materials science or biophysics. She considers the skills she gained during her internship a vital step on that path.